This Pick Pocket Math Number Trick Will Help Motivate Kids In MATh Learning. This Pick Pocket Math Number Trick helps kids get practice with addition, subtraction, and multiplication all in one shot! Really impress friends and family by correctly guessing the amount of change they have in their pockets! Find a volunteer to work your math magic on. Make sure your volunteer has some change in their pocket. But they do not reveal it to you..
Have your volunteer multiply their age by two. Then they will add five. Now multiply the previous sum by fifty. 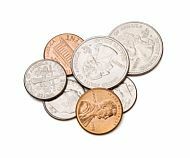 Add the amount of pocket change, but do NOT count any change that is over $1. Notice that the first two digits will be the person's age,and the last two digits are the amount of the person's pocket change. Birthday Math Trick: In this trick, guess a person's age by doing some simple math magic, and watch the surprised look on their face. And you can go to the main math tricks section of this site by clicking the link below. You'll find many more math tricks and cool stuff there.